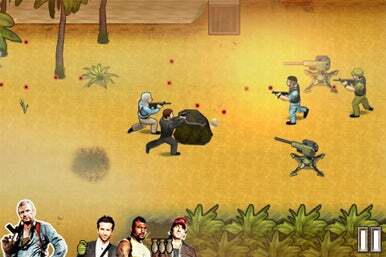 The A-Team and all its campy, nostalgic glory has already invaded a theater near you, but The A-Team app, an action-adventure shooter game from RealNetworks, Inc., brings another dimension to the movie’s promotional blitz. Perfectly suited for a movie about action heroes, the game is an over-the-top side-scrolling third person action shooter complete with explosions, bullets and more explosions. From the moment the app launches, you’re immersed in the A-Team universe, complete with high definition environments, a snare drum soundtrack, and B.A. Baracus voiceovers. A series of twenty increasingly difficult missions leads you through an unidentified war zone, where you blast bad guys, unlock achievements, and rescue your team members. The A-Team is comprised of four members – Hannibal, Murdock, Face, and B.A. Baracus – and over the course of the game, you can play as all of them. At all times, all four characters’ pictures appear on screen, with a red shadow indicating their health levels. You can tap around to select whomever you feel like using, either according to current health or special ability (Murdock launches missiles from a helicopter, for instance). Each level is littered with doors to unlock, roadblocks to explode, and enemies to shoot down, all in a maze of a landscape you must navigate to get to the end. Plenty of instructions and on-screen prompts remind you of what you’re trying to do at any given moment. For such a high-concept game, it’s actually pretty simple to master. Interestingly, you can’t control shooting in this game. An on-screen joystick controls movement (or you can drag your finger along the screen), but the characters automatically aim and shoot whenever an enemy is close to them. The team generally sticks together automatically as well, providing good defense for whomever you’re using at that time. Things start out pretty easily and become harder as you go, but there are three difficulties to choose from if you need more of a challenge. The game also features fourteen achievements and a statistics section that records everything from your shots fired to how many enemies you kill per minute, on average. For an app that wouldn’t exist if it didn’t have a movie to promote, The A-Team is a complete and satisfying 3rd person shooter game. An approachable $2 price tag is just the icing on a well-executed public relations cake.